Welcome to a new member of the BIO PLANÈTE Coconut Family! After 400 ml, our popular organic BIO PLANÈTE coconut fat is now also available in a 1 l container. The big size is especially convenient for heavy user like caterers, restaurants and natural cosmetic manufacturers. BIO PLANÈTE Coconut Fat is a suitable substitute for consumers who are not fond of natural coconut flavor in their food, but are looking for a healthy alternative for cooking and frying. The coconut fat has been carefully treated with steam and is neutral in scent and savor. This makes the coconut fat highly versatile for culinary purposes: It is excellent for baking and frying at high temperatures and as an alternative to butter. It works especially well for scrumptious cakes or desserts, too. BIO PLANÈTE Coconut Fat Mild is suitable for vegetarians and vegans. Despite the treatment with steam, BIO PLANÈTE Coconut Fat still displays a high lauric acid content. Coconut oil contains mainly medium chain fatty acids, the kind of saturated fatty acid that speeds up our metabolism to give us instant energy. This precious lauric acid has antibacterial, antiviral and antifungal properties. Our mild coconut fat is processed at the German production site of Moog Oil Mill and is vacuum-packed. A vacuum seal serves as a guarantee of quality since breaking the seal is audible when the container is opened. 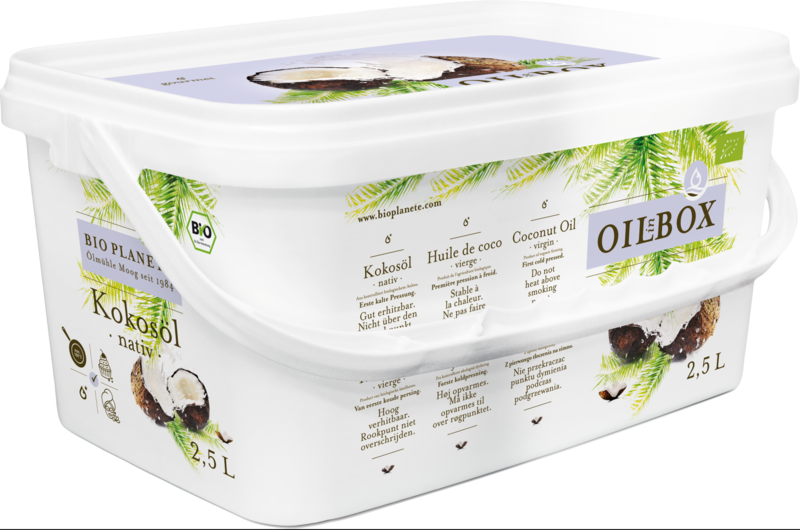 The additional warranty banderole ensures that BIO PLANÈTE coconut fat has left the oil mill in impeccable condition. Find out more about BIO PLANÈTE Coconut Fat Mild here.